ECLEXYS has pioneered in the field of integration of different ICT techniques in healthcare/caregiving since 2005, entering in partnership with major players of this sector and rapidly becoming a reference counterpart for healthcare providers interested in advanced R&D solutions in Switzerland and elsewhere. The success of ECLEXYS proposal is also testified by a rich heritage of successful participation to FP7 and H2020 funded projects, in which the company has played an often-crucial role by unveiling cost-effective and uncommon solutions. Development of advanced medical sensors, able to make the collection of medical data, using no-contact methods, easier and more comfortable. Demonstration of sophisticated solution to facilitate man-machine interaction when the user is elderly, in distress, or uncomfortable dealing with electronic devices. 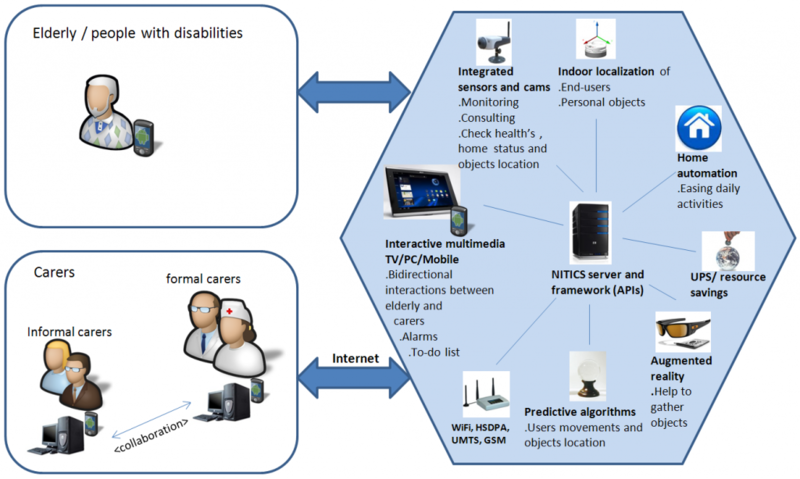 Pioneering research in the domain of “intelligent gateways” able to make transparent to end-users and caregivers the setup of a network of domotic and medical sensors. This achievement removes one of the major roadblocks in the deployment of ICT-supported healthcare assistance to home patients and elderly people. Exploitation of advanced ICT solutions to allow collection and transmission of important biomedical data even in the ambulances, allowing emergency room personnel to gain precious time and to offer a customized treatment to critical patients brought to their premises. The AAL NITICS project, primed by ECLEXYS, has shown ICT potential to streamline assistance procedure, cutting down healthcare costs.